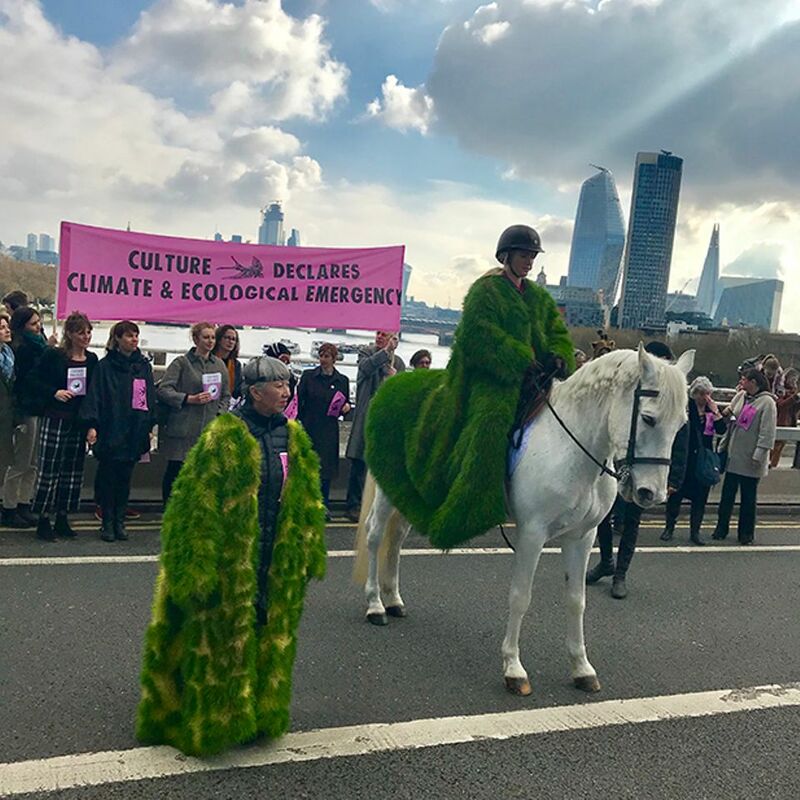 A woman wearing a living grass coat sat atop a white horse stopped central London traffic yesterday. She was at the head of a procession to mark the launch of Culture Declares Emergency, an initiative that calls for individuals and organisations across the UK’s cultural sector to declare a “climate and ecological emergency”, and to pledge immediate action in combating the devastation of the planet. Among those who have already declared and pledged are London’s Royal Court Theatre, HOME in Manchester and Somerset House, where its director Jonathan Reekie saw the march off and stated his commitment to “harnessing the transformative powers of the arts and culture” to the cause. From Somerset House there were readings and declarations on Waterloo Bridge and at the Southbank Centre before the entire procession, horse and all, entered Tate Modern’s Turbine Hall. Here the poet and performer Zena Edwards donned another coat of grass—like that of the rider— which was made by the artists Ackroyd & Harvey and belted out an uplifting paean to action: “I sing of a rebirth/ not a victim song”. 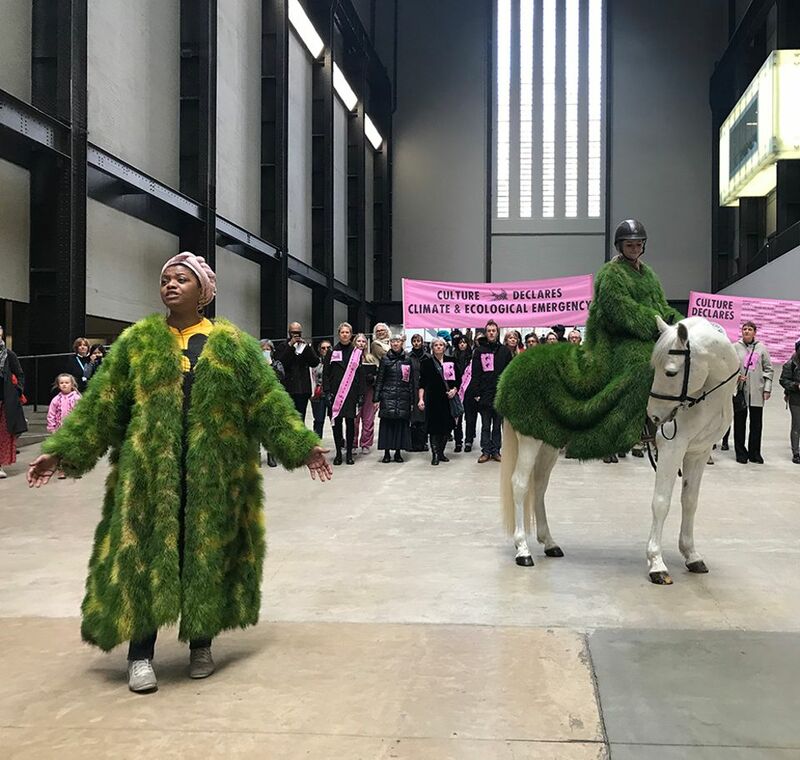 Although the Tate are not yet official declarers or pledgers, the occupation was carried out with the blessing of Tate Modern's director Frances Morris, who authorised their entry and posted an image of the event from the Turbine Hall's bridge where she observed the proceedings, declaring on her Instagram that they were “welcome”. It was all considerably calmer than the last equine presence in the Turbine Hall over a decade ago when a performance-work by Tania Bruguera introduced two mounted policemen to patrol the space and exercise crowd-control techniques on the visitors.